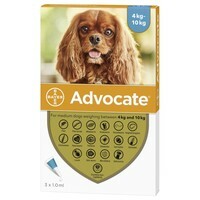 Advocate Medium Dog for dogs weighing between 4 and 10Kg (Advocate 100 contains 1.0 ml (100 mg imidacloprid, 25 mg moxidectin) and is a broad spectrum combination treatment, effective against fleas, flea larvae, roundworms, hookworms, whipworms, heartworms and Sarcoptic mange, ear and Demodex mites. Advocate Medium Dog gives you proven flea and flea larvae control as well as effective control of intestinal nematodes, heartworm and mites. I've bought this product from you before! I called my vet today and told them I wanted them to price match - but they just cant! They charge £12.77 for the prescription and even then it would cost me approx. £11 more buying from them! awaiting the prescription and will be putting in my order with you - plus some other stuff! Great product. Much cheaper than the vets even after prescription charge. I rate it 5. Was first introduced to this product when we picked up our dog from Dogs Trust. The vet also recommended it, but found that it's cheaper to buy it from VetUK (with a prescription from the vet). Great service from VetUK. Always prompt delivery. I think this is great tretment which my vet first put my dog on it, my little dog has been on this for long time after he got mainge from fox's which are in our garden most nights,i buy the 4kg,he has never had any problem since, The vet is now charging £5 for prictpitions now, if i bought a pack of 3 from the vet it would be £25.37 and here it's £14.96 plus the £5 vet charge the total would still only be £19.96, so am going to go for the 6 pack,so total for that is £26.93 just a little more to pay, the vets charge nearly the same for 3. This is an excellent flea treatment in my opinion. It is recommended by my vet who is kind enough to write me a free prescription which allows me to buy it at this low price instead of the surgery prices. I wouldn't use anything else. Advocate once used gives me peace of mind for my 2 miniature schnauzers.